The Qatar Stock Exchange (QSE) started Tuesday’s trading session in green territory, supported by the increase of six sectors. 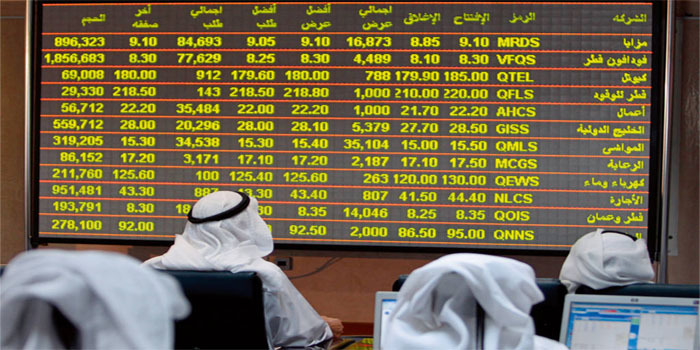 By 10:00 am Qatar time, the general index grew 0.49% to 9,310.03 points, adding 45.03 points. The bourse’s turnover amounted to QAR 41.2 million after 3.6 million shares were exchanged through 498 transactions. The banking sector topped the QSE’s risers adding 1% as Ahli Bank and the heavyweight Qatar National Bank rose 2.96% and 1.28%, respectively. Similarly, the goods and services sector advanced 0.48%, boosted by the jump of Al Mannai and Medicare Group by 3.82% and 1.53%, respectively. On the other hand, the industrial sector was the bourse’s only loser falling 0.34% as Qatar Electricity and Water declined 0.71%. Vodafone Qatar’s stock, which levelled up 1.09%, led the market in terms of trading volume with 3.8 million shares, generating QAR 36.3 million in liquidity.